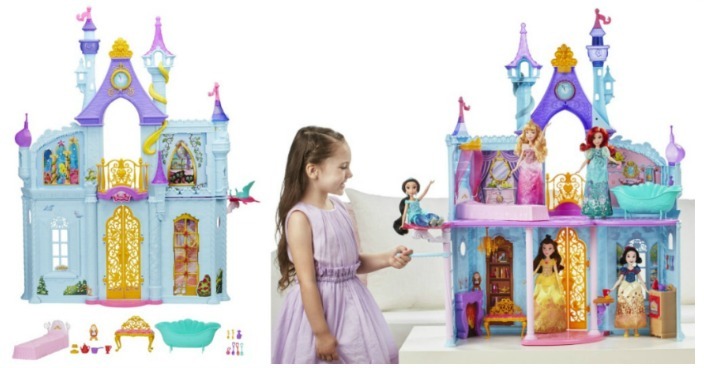 Disney Princess Royal Dreams Castle Just $61.59! Ships FREE! You are here: Home / Great Deals / Christmas Deals / Disney Princess Royal Dreams Castle Just $61.59! Ships FREE! Right now you can get this Disney Princess Royal Dreams Castle for just $61.59 (Reg. $88) at Walmart! Your little princess can live out her big dreams and favorite fairy tales in the Royal Dreams Castle! This enchanting playset is over 3 feet tall and features 4 furnished rooms of fun! Each room is themed around a Princess — Snow White’s kitchen, Belle’s library and ballroom, Sleeping Beauty’s bedroom and Ariel’s bathroom. Nineteen accessories — a bathtub, bed, bed canopy ring, soft canopy curtain, 5 kitchen utensils, kettle, pot, cup, stove, seat, Snow White’s pie, plate with pie, shampoo bottle, soap, chandelier and clock — make for seemingly endless fairy tale fun. There’s even a magic carpet elevator ride for Jasmine — just lift the handle and then release to see the carpet glide down! Dolls sold separately.